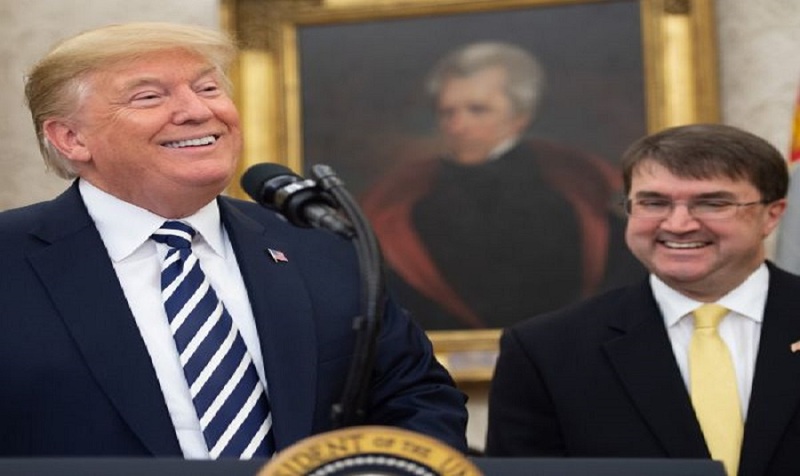 Last week President Trump lauded his recently confirmed Secretary of Veterans Affairs Robert Wilkie before the Veterans of Foreign Wars (VFW) National Convention, and with good reason. Simply put, Wilkie is one of the president’s best appointments. In short, Wilkie brings the best skill set we’ve ever had in an incoming VA Secretary. It’s a skill set and real experience the scandal-ridden department, best known for inefficiency, sorely needs. Wilkie, the son of a career Army officer has served in uniform himself, and with distinction. He knows the needs of our veterans first hand. A long-time staffer in both the U.S. House of Representatives and U.S. Senate, he knows how to get things done for our veterans on Capitol Hill. He also served on the National Security Council under Condoleezza Rice and as Assistant Secretary of Defense under Donald Rumsfeld. His most recent experience as Under Secretary of Defense (Personnel and Readiness), however, is what he can draw on to have the greatest immediate impact on the VA. For years, the Department of Defense would try to give new medical technology it had developed for the warfighter to the VA to help our nation’s veterans. Time and time again, the VA would turn it down, only to spend taxpayer dollars to reinvent what the Pentagon had on a shelf. Congress, fed up with this, started the DOD/VA Health Care Sharing Incentive Fund. Now known as the Joint Incentive Fund (JIF), it has been representative of the kind of mechanism we need in place to ensure our veterans get the best healthcare and access to the best medical technology available, while being good stewards of taxpayer dollars. During the 2016 presidential campaign, the ineptitude of the Department of Veterans Affairs and its failure to properly take care of our nation’s veterans was a major issue. America’s veterans wanted real change at the VA, and then-candidate Donald Trump responded with his ten-step plan to bring real reform to the troubled department. Our nation’s veterans responded and played a big role in his election to the presidency. Today, there is no doubt that President Trump is focused on reforming the VA to better serve our veterans. There is much to do. Our veterans wait too long for healthcare. There is a different standard of care depending on which part of the country you live in. In fact, The VA regions (known as VISNs) each have different medical products on their approved lists for such things as wound care. Thus, a VA medical center in Alabama may not be able to give a veteran a needed medical product that he could get if he or she were at a VA facility in Virginia. There are also way too many sole-source contracts being awarded and not enough competition. Open competition and pilot programs showcasing the latest medical technology will benefit both our veterans and taxpayers. And we still hear horror stories about the VA claims process. When going through a claim, why should the VA spend more taxpayer dollars on services that have already been performed by a military doctor? These are just a few of the many challenges facing our new VA Secretary. There will need to be true transformational change in the VA’s culture for any true improvement in our veterans’ care. We must have a “VA owns it” mentality and get rid of those employees who don’t embrace the culture change. Over the years senior government officials, including one cabinet secretary and one four-star general, have told me, “I wish I knew then what I know now.” They were co-opted by the bureaucracy when they assumed their positions and were convinced that all was fine when it wasn’t. Robert Wilkie has a chance to be the best VA Secretary we’ve ever had at a time when we really need it. The reason is that he can’t be hoodwinked by the institutional bureaucrats. The veterans of our country need a secretary like this and it’s about time. Van Hipp is chairman of American Defense International, Inc. (ADI), a Washington, D.C. consulting firm. He is former chairman of the South Carolina Republican Party, and served on the Presidential Electoral College in 1988. He is the author of “The New Terrorism: How to Fight It and Defeat It.” To read more of his reports, Go Here Now.